Successfully Added HK Warehouse Oukitel U15S Android Phone - 5.5 Inch FHD, Octa-Core CPU, 4GB RAM, Dual-IMEI, 4G, 13MP Camera, 2450mAh to your Shopping Cart. The Oukitel U15S Android phone features a 5.5-Inch display on which it lets you enjoy a stunning visual experience. With its IPS technology, this screen brings forth crisp details and a wide color gamut no matter your viewing angle. It features 1080p resolution, meaning that you’ll be treated to breathtaking Full-HD resolutions. Whether you watch a movie, pictures, or simply browse the web – this Android smartphone is sure to satisfy your media demands. It comes with 32GB internal memory and a 128GB SD card slot. Therefore, you’ll always have enough space to store your files and media. Within its sleek body, this Android smartphone holds a powerful Octa-Core processor. Clocked at 1.5GHz, this CPU lets you tackle all the Android Apps of your liking. The cell phone furthermore comes with 4GB RAM. No matter what you throw at it, the Oukitel U15S is sure to handle it without dropping a frame. Thanks to its 2450mAh battery, you’ll be able to enjoy all your favorite smartphone features for up to 16 hours in a row. Android 6.0 treats you to a great user experience while staying connected to friends and family. The phone comes with Dual-IMEI numbers and 4G connectivity. This means that you’ll always be able to enjoy the fastest mobile data speeds no matter where you are. From now on, you can browse the web and stay within reach to your loved ones at any time of the day. With the Oukitel U15S Android phone in your pocket, you’ll never be out of reach. 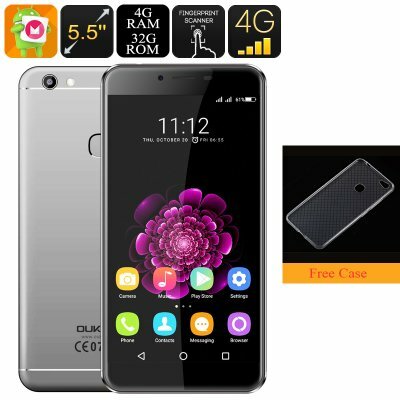 The Oukitel U15S Android phone comes with a 12 months warranty, brought to you by the leader in electronic devices as well as wholesale Android smartphones..